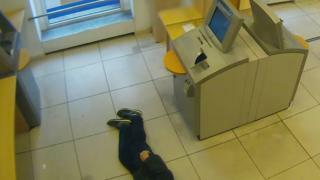 A judge has imposed heavy fines on three people in the western German city of Essen for ignoring an elderly man who collapsed next to bank cash machines. The 83-year-old man hit his head on the tiles and died a week later. A fourth person had also ignored him, but was not ruled fit to stand trial. Medics were only alerted by the fifth customer at the scene. The customers were identified in CCTV footage, which showed them stepping round the critically ill pensioner. It took 20 minutes for the man to receive first aid. Under German law, failure to respond to a medical emergency is punishable by a fine or up to a year in jail. People are required at least to alert emergency services, if they lack first aid skills. The court imposed a €3,600 (£3,180; $4,303) fine on a woman aged 39. Do you have to rescue someone in danger? In similar cases a fine is often agreed out of court between defence lawyers and prosecutors, the German news website Süddeutsche Zeitung reports. The incident - at a Deutsche Bank branch in Essen, in the western, industrial Ruhr region - triggered anguished debate in Germany. Some argued that it symbolised a coarsening of society, with many people indifferent to their fellow citizens' welfare. The judge justified the fines by saying "nobody wanted to help". Prosecutor Nina Rezai was quoted as saying the fines must be heavy because "the duty to help a fellow human being was blatantly violated". She said the fines would send a signal that "we're not going in the direction of a society that looks away". A medical report into the death found that the man's head injury was so severe that he would have died even if a medic had reached him earlier. Two of the defendants told the court they had believed the pensioner to be homeless. Some homeless people did use the area with cash machines as a shelter at the time, as it was accessible without a bank card, and the 39-year-old woman who was fined said she had been harassed by them previously. However, another prosecutor was sceptical about that argument, saying the customers would have seen that the man was well dressed, lying in the middle of the room and had no bags carrying belongings or a sleeping bag. The Essen prosecutor, Birgit Jürgens, said she had "never experienced anything like this". She has been working in the state prosecutor's office since 1991.